We are the children of the martyrs! We are the children of those who perished in the flames! Over 65 million have been martyred since the time of Christ. 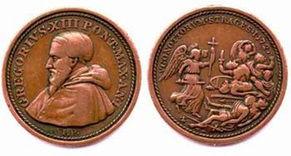 The Church of Rome wages war against the Reformation. 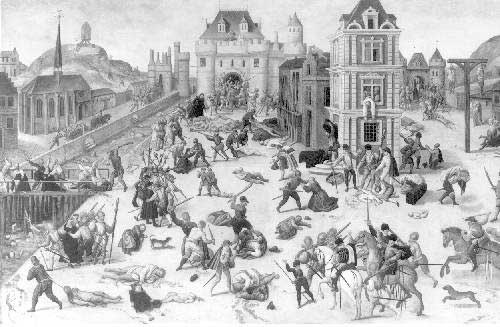 The St. Bartholomew's Day Massacre in France. 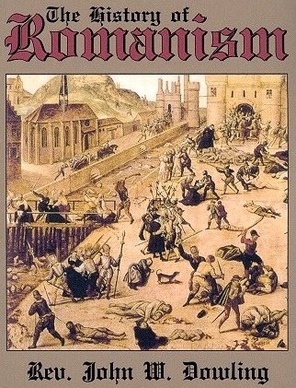 August 24, 1572, was the date of the infamous St. Bartholomew's Day Massacre in France. On that day, over 400 years ago, began one of the most horrifying holocausts in history. The glorious Reformation, begun in Germany on October 31, 1517, had spread to France—and was joyfully received. A great change had come over the people as industry and learning began to flourish, and so rapidly did the Truth spread that over a third of the population embraced the Reformed Christian Faith. However, alarm bells began to ring at the Vatican! France was her eldest daughter and main pillar—the chief source of money and power. . . . King Pepin of the Franks (the father of Charlemagne) had given the Papal States to the Pope almost 1000 years earlier. Almost half the real estate in the country was owned by the clergy. Meanwhile, back in Paris, the King of France and his Court spent their time drinking, reveling and carousing. The Court spiritual adviser—a Jesuit priest— urged them to massacre the Protestants—as penance for their many sins! To catch the Christians off-guard every token of peace, friendship, and ecumenical good will was offered. Suddenly—and without warning—the devilish work commenced. Beginning at Paris, the French soldiers and the Roman Catholic clergy fell upon the unarmed people, and blood flowed like a river throughout the entire country. Men, women, and children fell in heaps before the mobs and the bloodthirsty troops. In one week, almost 100,100 Protestants perished. The rivers of France were so filled with corpses that for many months no fish were eaten. In the valley of the Loire, wolves came down from the hills to feel upon the decaying bodies of Frenchmen. The list of massacres was as endless as the list of the dead! Many were imprisoned—many sent as slaves to row the King's ships—and some were able to escape to other countries. . . . The massacres continued for centuries. The best and brightest people fled to Germany, Switzerland, England, Ireland and eventually America and brought their incomparable manufacturing skills with them. . . . France was ruined. . . . Wars, famine, disease and poverty finally led to the French Revolution—the Guillotine—the Reign of Terror—the fall of the Roman Catholic Monarchy—atheism—communism etc., etc. When news of the Massacre reached the Vatican there was jubilation! Cannons roared—bells rung—and a special commemorative medal was struck—to honor the occasion! The Pope commissioned Italian artist Vasari to paint a mural of the Massacre—which still hangs in the Vatican! to commemorate the slaughter of over 100,000 French Christians!! "The history of Baptists was written in blood." This huge volume contains a comprehensive and complete history of the so-called Roman Catholic religion up to the mid-Nineteenth Century. In these pages, the reader will see and understand the unscriptural doctrines and ceremonies of Romanism, the lives of its most distinguished popes, the proceedings of its celebrated councils, the details of its tyranny over monarchs and states, its inquisitions, tortures, and massacres, and the efforts of the Lord's remnant in various ages to deliver the world from its thraldom. This is information which the modern neo-Romanist apologists such as Scott Hahn, Patrick Madrid, and Gerry Matatics, do not want their proselytes to read. Protestants have traditionally viewed the Papacy as Antichrist and this book will give much credence to that assertion. Click Book for full View reading! The "Story of Liberty" is a true narrative. It covers a period of five hundred years, and is an outline of the march of the human race from Slavery to Freedom. There are some points in this book to which I desire to direct your attention. You will notice that the events which have given direction to the course of history have not always been great battles, for very few of the many conflicts of arms have had any determining force; but it will be seen that insignificant events have been not unfrequently followed by momentous results. You will see that everything of the present, be it good or bad, may be traced to something in the past; that history is a chain of events. You will also notice that history is like a drama, and that there are but a few principal actors. How few there have been! The first to appear in this "Story" is King John of England. Out of his signing his name to the Magna (Marta have come the Parliament of Great Britain and the Congress of the United States, and representative governments everywhere. The next actors were John Wicklif and Geoffrey Chaucer, who sowed seed that is now ripening in individual liberty. Then came Henry VII., Henry VIII., Katherine of Aragon, Anne Boleyn, Katherine's daughter (Mary Tudor), Cardinal Wolsey, Archbishop Cranmer, Anne Boleyn's daughter (Elizabeth), King James, John Smith, John Robinson, William Brewster, and the men and women of Austerfield and Scrooby. In Scotland were Mary Stuart and George Buchanan; in Bohemia, Professor Faulfash and John Huss; in Germany, the boy who sung for his breakfast (Martin Luther), Duke Frederick, John Tetzel, and John Gutenberg; in Holland, Laurence Coster, Doctor Erasmus, and William the Silent; in France, Francis I., Catherine de' Medici, the Duke of Guise, Charles IX., and Henry IV. ; in Spain, Thomas de Torquemada, Isabella, Ferdinand, Christopher Columbus, Charles V., Philip II., and Loyola; in Italy, Alexander VI. and Leo X. These have taken great parts in the drama: actively or passively, they have been the central figures. One other thing: you will notice that the one question greater than all others has been in regard to the right of men to think for themselves, especially in matters pertaining to religion. Popes, archbishops, cardinals, bishops, and priests have disputed the right, to secure which hundreds of thousands of men and women have yielded their lives. You will also take special notice that nothing is said against religion—nothing against the Pope because he is Pope; nothing against a Catholic because he is a Catholic; nor against a Protestant because he protests against the authority of the Church of Rome. Facts of history only are given. Catholics and Protestants alike have persecuted, robbed, plundered, maltreated, imprisoned, and burned men and women for not believing as they believed. Through ignorance, superstition, intolerance, and bigotry; through thinking that they alone were right., and that those who differed with them were wrong; forgetting that might never makes right; honestly thinking that they were doing God service in rooting out heretics, they filled the world with woe. There is still another point to be noticed: that the successes of those who have struggled to keep men in slavery have often proved to be in reality failures; while the defeats of those who were fighting for freedom have often been victories. Emperors, kings, cardinals, priests, and popes have had their own way, and yet their plans have failed in the end. They plucked golden fruit, which changed to apples of Sodom. Mary Tudor resolutely set herself to root out all heretics, and yet there were more heretics in England on the day of her death than when she ascended the throne. Charles V. and Philip II. grasped at universal dominion; but their strength became weakness, their achievements failures. On the other hand, see what has come from disaster! how bitter to John Robinson, William Brewster, and the poor people of Scrooby and Austerfield, to be driven from home, to be exiles! But out of that bitterness has come the Republic of the Western world! Who won—King James, or John Robinson and William Brewster? There is still one other point: you will notice that while the oppressors have carried out their plans, and had things their own way, there were other forces silently at work, which in time undermined their plans, as if a Divine hand were directing the counter-plan. Whoever peruses the "Story of Liberty" without recognizing this feature will fail of fully comprehending the meaning of history. There must be a meaning to history, or else existence is an incomprehensible enigma. Some men assert that the marvellous events of history are only a series of coincidences; but was it by chance that the great uprising in Germany once lay enfolded, as it were, in the beckoning hand of Ursula Cotta? How happened it that behind the passion of Henry VIII. for Anne Boleyn should be the separation of England from the Church of Rome, and all the mighty results to civilization and Christianity that came from that event? How came it to pass that, when the world was ready for it, and not before, George Buchanan should teach the doctrine that the people were the only legitimate source of power? Men act freely in laying and executing their plans; but behind the turmoil and conflict of human wills there is an unseen power that shapes destiny—nations rise and fall, generations come and go; yet through the ages there has been an advancement of Justice, Truth, Right, and Liberty. To what end? Is it not the march of the human race toward an Eden of rest and peace? If while reading this "Story" you are roused to indignation, or pained at the recital of wrong and outrage, remember that out of endurance and sacrifice has come all that you hold most dear; so will you comprehend 'what Liberty has cost, and what it is worth, 1879. To understand why we are not some other denomination, religion or faith - We must first understand what we believe - At least the core beliefs - Held thru the centuries! Every other denomination that is known today, had its beginning in the last four hundred years. Everyone of the them - whether it be the Church of Christ; the Church of England; the Lutheran; Anglican; Methodist; Episcopal; Church of God; Christian Church and right down through the line - who have all claimed to have the only correct doctrine - this raise some serious question. If their doctrine is the only correct doctrine - why were they only recently established? Was the Biblical truth not known before that time? - Gee I wander how people got saved before they were established - A legitimate question to ask these other groups - But yet we know people have continued to be saved, long before. The roots of the Baptist can be traced back to apostolic times, not just by Baptist, but by the enemies of the Baptists - Historians testify that "local churches: which hold doctrine, beliefs, and practices of today’s Bible believing, separatist Baptist; have had a continuous existence since the days of Christ. This can not be said of any other church, churches, or religious organization." Sir Isaac Newton said, "The Baptist are the only body of known Christians that have never symbolized with Rome." Ypeij and Dermount, eminent historians of the Dutch Reformed Church said, "The Baptist may be considered as the only Christian community that has stood since the days of the Apostles, and as a Christian society has preserved pure the doctrine of the Gospel through all the ages." Alexander Campbell, founder of the Campbellites / Church of Christ who rigulously opposed Baptist during the 19th century, wrote, "The sentiment of Baptist and their practice of Baptism from the Apostolic age to the present have had a continued chain of advent and public monuments of their existence in every century can be produced." Robert Barkley a Quaker historian says "We shall afterwards show that the rise of the Anna-Baptist took place prior to the reformation of the Church of England and there are also reasons for believing that the continent of Europe small hidden Christian societies who have held many of the opinions of the Anna-Baptist have existed from the times of the Apostles. In the since of the direct transmission of Divine truth and the true nature of spiritual religion it seems probable that these church have a lineage or succession more ancient than that the Roman church. All Christian were then Baptist." John Clark Rippath said "I should not readily admit that there was a Baptist church as far back as 100 A.D. Although without doubt there were Baptist Churches then, as all Christian were then Baptist." Mosheim said "Before the rise of the Lutheran Calvin, there lay secreted in almost of the countries of Europe persons who adhered tenacious to the principle to the modern Dutch Baptist. The origin of Baptist is lost in the remote depths of antiquity, the first century was a history of Baptist." Zwingli said, "An institution of the Ana-Baptist is no novelty, but for thirteen hundred years has caused great trouble in the church (the Catholic and Presbertirian) Baptist are known as trouble maker because we hold to the purity of doctrine of the NT and we don’t apologize for it - If you spend any time witnessing you’ve witnessed it." Catholic Cardinal Hoseios President of counsel of Trent from 1545 - 1564 said, "were it not for the fact that the Baptist have been grievously tormented and cut off with the knife during the past 1200 years, they would swarm greater than all the Reformers. If the truth of religion were to be judged by the readiness and boldness of which a man or any sect shows in suffering, than the opinion and persuasions of no sect can be truer and surer than those of the Anna-Baptist. Since there have been none for the 1200 years past that have been more generally punished or have been more cheerfully and steadfastly undergone and have offered themselves in the most cruel sort of punishment than these people." It is unlikely that the Reformers stumbled upon the great truth of "justification by faith" on their own - these were men who were well aware of Anna-Baptist. If they were not directly involved with some of the tortures, they certainly witnessed the testimonies of those people as they were tortured and died. It is more likely that the Holy Spirit used it and worked in their hearts as they studied the Word of God and they concluded that what the Anna-Baptist were saying was true. Baptist Christians must understand why they believe what they believe, then they will see the error of the other denominations and religions as such. We believe that God has maintained a church in every age that has held to the pure doctrine of the Scripture. History shows that it is the Baptist. Spurgeon said, "history has hitherto been written by our enemies, who never would have kept a single fact about us upon record if they could have helped it. And yet it leaks out every now and then the a certain poor people called Anna Baptist - Anna-Baptist a name given to the Baptist before the sixteenth century. "Anna" means again - but the entire name was applied what Bible believing separatist Baptist do today. They were brought for condemnation ... heretics who were hated of all men for the true sake that was in them ... burned for the crime of Anna-Baptistism ... were protesting for the one Lord, one faith, one baptism. No sooner did the visible church begin to depart from the Gospel than these men arose to keep fast then by the good old way ... calling men to the errors of their ways ... our histories forbid discouragements." We know that the Baptist were very much involved in the founding of this nation - especially as to religious freedom. Those Baptist founding Fathers understood this, given the freedom of the gospel of grace some people might be saved - we have a superior message that changes life. Through the history of Baptist the enemy (Satan) has always tried to coerce and hold down and stifle the true preaching of the Word of God - Given the opportunity through the reasoning of the Scriptures, God will have the victory. 1. Forerunner was John the Baptist (Luke 3:1-4). 1. Baptist can be easier traced by blood than by baptism. 2. They were named by their enemies - Anabaptist from infant baptism). a. He is God - Deity of Christ (1 Tim. 3:16). b. He arose bodily from the dead - The Resurrection (Luke 24:39). c. He is coming back literally - The Second Coming (Acts 1:11). 1. Christ the author, originator, and Head of the Church (Matt. 16:18; Col. 1:18). 2. Two kinds of officers and only two - Pastors and Deacons (1 Tim. 3:1-13). 3. Only the saved are to be received as members (Acts 2:47; Eph. 2:21; 1 Pet. 2:5). other (Matt. 16:18; Rev. 22:16). 5. It’s polity - Congregational - all members are equal (Matt. 20:24). make new ones (Matt. 16:18; Col. 1:18). This page contains links to external websites. especially regarding the Plan of salvation. We simply feel they have provided some worthwhile perspective related to this content.